AngularJS application depends on controllers that controls the data flow in the application. A controller is responsible to build a model for view to display. A model contains the data that need to work with and a controller will perform some operations to grab that data such as it does some calculations or call back a web server that talks to a database whatever it takes. Controllers maintain the application logic and provides logic to the view. Views are the HTML pages i.e., where a user can see the output. AngularJS applications are controlled by controllers. AngularJS Module initializes the AngularJS application. Just like ng-app, ng-controller is another directive. And, when ng-controller is used, the name of a controller has to be specified that takes control of some part of the HTML. ng-app initializes Angular, which will take control of that div and everything inside it. Below is an example to combine the first name and last name using AngularJS Controller. AngularJS can be called with a controller $scope object. $scope is the owner of application data within the SPController. $scope.firstname and $scope.lastname are the properties created by the SPController. In the above demo, SPController is defined as a function. $scope is an object that is passed as an argument for controller and this object can be used to bind the data from application controller to the view. 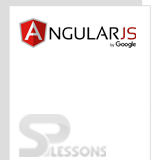 More detailed information about scope object is available in the chapter AngularJS – Scope topic. $scope is passed as a parameter by each controller, which alludes to the application data within that specific controller. Controllers contain attributes/properties that are defined using ng-controller directive. $scope is accepted as a parameter by Controller that refers to the application that is controlled by the controller. $scope is an object that is passed as an argument for controller.